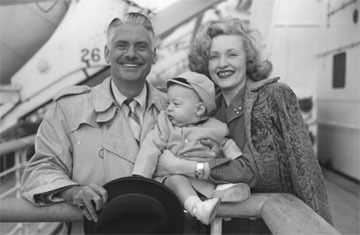 Above, baritone Wilbur Evans with son Michael and wife Susanna Foster. 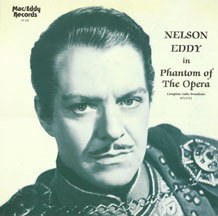 Evans starred in the West End production of South Pacific. 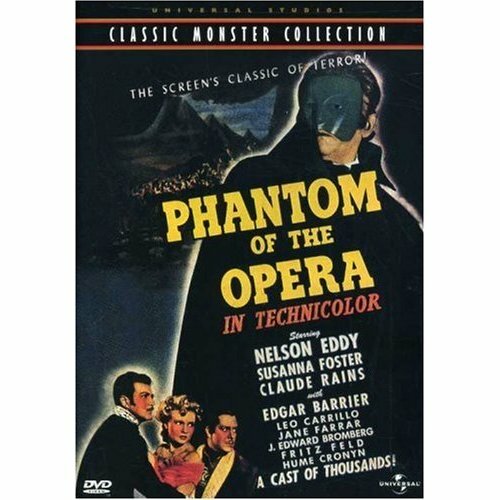 Forget Phantom of the Opera, Nelson Eddy, Claude Rains, etc. For Susanna Foster, the real horror movie was played out in real life. It seems that Michael Evans (Susanna Foster‘s son) has finally now begun telling in detail on his blog the painful details of his mother’s childhood and life…incidents that he talked to us about at the New York club meeting that left us somewhat stunned but very sympathetic. Susanna’s mother Adie, his grandmother, was a monster – made Joan Crawford look like Good Housekeeping’s Mother of the Year! The Larson’s lived a comfortable upper-middle class life until the crash of 1929, and then all hell would break loose for millions of Americans. After about 1931 when the dollars mysteriously ran out, things swiftly declined; Les could not find work, if he did it was menial, sold type writers, fixing small appliances etc. They often moved every month, being evicted for lack of rent $$. Victoria’s [sister] Scarlet Fever-Quarantined sign on the door. Gas company turned off the gas- no heat-no cooking. Les [father] appealed to the gas company-they would not turn it back on. Les was humiliated when he had to steal gas from the downstairs neighbor. Adie [mother] was paradoxically a “wonderful mother”/ nurse- Svengali- like. Dragging the girls across the floor by their hair when rage would frequent Adie. Suzanne coming home from school to find the apartment wrecked, human feces on the kitchen walls with Adie slumped over the kitchen table, drunk and puking. Terrific fights; where furniture was broken and bones nearly. Kathleen [sister] would hold her breath and turn blue “…when she couldn’t get her way..”. Maybe just to survive. Suzanne’s almost fatal bout with pneumonia. I would take some time to read Michael’s latest blog post, also the entire blog…and post a comment for Michael as well. Excerpts from my interview with Susanna Foster, recorded at Musso and Frank’s restaurant, 1983. © 1983, 2005 by Sharon Rich, all rights reserved. You may quote from this interview as long as you reference me and this link. Sharon Rich: You actually started your film career at MGM in 1937? Susanna Foster: Yes, they’d just let Deanna Durbin go. I’d just gotten over pneumonia about six months before. I was the skinniest, ugliest thing you’d ever seen. They sent out the talent scout and signed me to a contract sight unseen. I was skinny, all eyes, nose and mouth, but I did have a remarkable voice, and very good quality. I was brought out there and stayed (at Metro) for three years. Sharon Rich: Did you meet [Louis B.] Mayer? Susanna Foster: Oh year, on the train – it’s a really funny story. I had heels this high on, and legs like sticks. I was sixty-nine pounds. I had white spots on my lungs from my pneumonia, and they were afraid I’d have tuberculosis. I had a little derby hat and I carried my mother’s black fox fur all over the train. 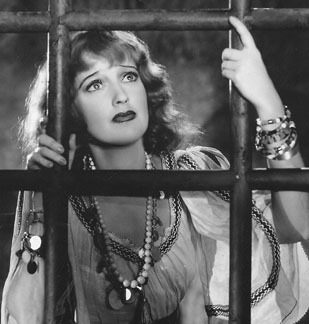 I thought I was Jeanette MacDonald, my idol. When I looked in the mirror, that’s who I was. I did not see me. 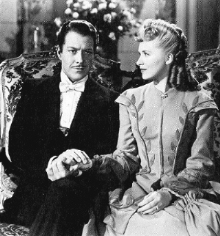 When I first saw myself on the screen in The Great Victor Herbert, I thought ‘Oh my God, I’m not Jeanette MacDonald!’ I was so disappointed. I never liked myself on the screen. And so anyway – Ida Koverman [Mayer’s secretary] met me at the train along with some press man, and we went straight to Mayer’s office. And there was a long grey carpet. And then my Pomeranian spitz proceeded to do his thing on the rug. He (Mayer) was friendly…. He was very nice to me. Sharon Rich: Did they utilize you right away? Susanna Foster: I made a test, where they said I had hair exactly the same shade as Garbo’s. That impressed them for some reason. George Sidney directed the test, and they were so impressed with the acting. They didn’t think I could act like that. They said, “She’s such a little doll, and her hair’s the same shade as Garbo’s,” you know. They called me up to the office and asked me, “What would you do if you were offered a million dollars, everything you wanted, to sign for Wheaties if you didn’t like Wheaties?” I said, “I’d never do that, never!” They laughed and got a real kick out of it. But, you know, they were very politically oriented. I’m not, with a vengeance. They did try to groom me. I went to school with Judy Garland and Mickey Rooney. At one point, they were considering me and Johnny Arlington to play Jeanette and Nelson as children in The Girl of the Golden West. But I didn’t look enough like her…. When they let me go, [they] said, “You can’t sing.” They were ready to let me go…. My mother had gone through thirty-seven jobs, and when I told her they fired me – that’s when I grew up. That’s when I severed the umbilical cord. I mean, I still loved my mother but I realized I was on my own. Up until then, I’d done what mother said. I really think my mother interfered too much. And also, you had to get in the groove. Judy was right in it, she kissed everybody’s fanny. I didn’t like Judy, I’ll tell you that right now. Very egotistical, to me she had no class, that’s all. Yet, I saw her at Carnegie Hall. She was very jealous of everybody. Very jealous of Jeanette. She made fun of Jeanette at Carnegie Hall; I could have killed her. She got up and tried to imitate Jeanette doing “San Francisco” and then she did a terribly awful jazzed version of it. From an actor’s viewpoint, Jeanette was a good actress. She knew her onions. But, I must say, when Judy was in the groove, as she was that night at Carnegie, she was an artist, a great artist. But she was not a pleasant person, I’m sorry. And all this stuff about being sorry for her and all this is a bunch of baloney. Now, Mickey was fresh….He was different. Very talented. Sharon Rich: Did you meet Nelson or Jeanette then, in 1937? Susanna Foster: I never once remember seeing Nelson. I think he made Rosalie that year. 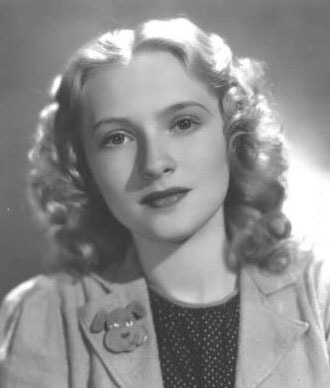 I met Jeanette in February 1937, before she married him (Gene Raymond). Now, you know Naughty Marietta is my favorite. I used to say I stopped counting the number of times I’d seen it after sixty-eight. Someone loaned a video tape of it, and I just watch it over and over. Now I have to say I stopped counting after a thousand. I never get tired of seeing that film. I met Jeanette on the set of The Firefly. I adored her, but what a shock! She treated me like I was two. She meant to be nice, but I was a brainy little girl. I had a very high IQ. I was so excited about meeting my idol, but I was also seeing her in the worst scene in the movie, where she had those bangs and that hair hanging down, and she didn’t look the way I wanted to see her look. Although her face was lovely, I wanted to see her as she was in Naughty Marietta. The one that impressed me the most to meet was Clark Gable…. When I first met him, I was only twelve, and they took me around to meet everyone. Spencer Tracy was atrocious. But Gable came in and he treated me like I was the Queen of England. He took my hand, and the way he bowed, I felt like he was being introduced to me. He had such class. No wonder everybody loved the guy…. You know, I never met Nelson the whole time I was at Metro. [I] left Metro and was at Paramount for two years, but I knew if Paramount didn’t have something soon for me, I was going to leave. They wanted to keep me on at the same salary, and I told them to forget it. I’ve got the letter somewhere. I wrote it when I was seventeen. It was so mature, a fourteen-page letter in which I told them that I was through with pictures – I was ready to quit then – and the whole way they’d done nothing with me, and paid me money for nothing; they were wasting money, and so on. Then, forty days later I signed for Phantom…. I used to go to the home of Ed Westgrate, who was a writer for The Hollywood Reporter. He’d been in World War I and had a wooden leg, and his eyesight was bad, and so on. But he was a delightful man, and his hobby was writing music. About once a week he’d have dinner with his friends. So, one night he invited Arthur Lubin (Phantom’s director) to dinner…. [Lubin] heard me sing. And then my teacher, who was teaching someone – either [Woody] Van Dyke’s wife, or somebody who knew Van Dyke [director and personal friend of Nelson Eddy and Jeanette MacDonald] – somehow I got invited to a Van Dyke party. And Nelson was there. He came over and sat and talked with me. I wondered why; I wasn’t anybody. I wondered either if he was interested in me as a person, or what he had in his mind. All of this happened, yet it had nothing to do with the fact that I was finally signed for Phantom. A man at Paramount suggested to Universal that Susanna Foster would be right for the part…. So then, after I met Lubin and Nelson, it all came together…. Sharon Rich: What stands out in your mind about making Phantom of the Opera? Susanna Foster: Everyone got along well on that set, and I think it had a lot to do with Nelson. When we did the Lux broadcast of Phantom, and I sang in rehearsal the “Nocturne,” I weighed at that time about 130 pounds. He lifted me right up in the air like I was nothing, up on his shoulders, after I took the top G…. The scar on Claude Rains was a big issue. Jack Pierce did the makeup. It was during the war, and a lot of boys were returning with these problems. They didn’t want to offend anybody, or hurt anybody. So there was a great amount of talk on how they were going to handle that scar. Maybe they expected something more grotesque or horrible…. [Pierce] knew the face and the bones. He’d know which way to pull a lipstick brush, whether to pull it this way or that way with the frame of your face. Claude Rains…was the only really great actor I ever worked with, and I worked with some really fine actors…. Now [Boris] Karloff (Foster’s co-star in The Climax) was just plain cold. I know people adored him Pierce adored him, you know. He said, “No one could play him (the Frankenstein monster) as he did.” It’s true, the way he created that mask, no one had the sadness and all in the face. But for me, I felt nothing. It was like working with a stick. I was an amateur and he was a professional. I don’t know, maybe being English, he was reserved. Rains was reserved too, but there was a little twinkle about Rains. 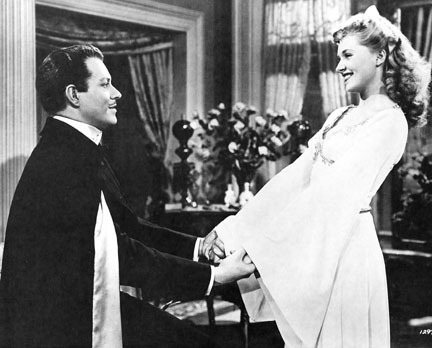 I think I mentioned to Rains that I was a little shy in this, my first big film, you know, with Nelson Eddy. My God – I didn’t dare even tell Nelson how much I’d loved him – I never did that. What a shame. I wish now I had. Sharon Rich: There were no actual ‘love scenes’ in Phantom. Susanna Foster: They could never decide whether there was going to be a love interest, or what they were going to do. 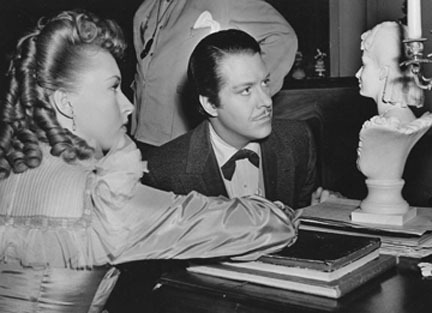 Besides, I was scared stiff that I’d have to kiss Nelson Eddy. Of course, to kiss anybody, I was scared stiff. It was very subtly cut out, and was never done. And I think Nelson got it cut because he felt that for him, with a young girl like that, and he knew I’d be embarrassed as hell. I remember in Naughty Marietta, he never liked love scenes himself. Jeanette had to do the doing herself, because that’s when he’d freeze up. I can understand it, I was a lot like him in so many respects – except that Nelson was a talker. He liked to talk and make jokes. I don’t know why, but he used to call me “Lady.” Not like I was a horse. He said it, “Hello, Lady,” like I was Lady Someone, so sweet. He was a great gentleman, with a lot of humor. And you know, he did sculpt. He did an original bust of me. I don’t know what he made it from, but I didn’t pose for it. He wanted me to do a tour with him, a concert tour, after Phantom. But I was scared. I was so young, just eighteen, and I didn’t realize that Nelson would have taken care of me, and I wouldn’t have had to worry. He knew the ropes, he’d have known exactly how to school me. I thought, I didn’t know enough, I hadn’t had enough training. I’m just a natural and I’d only had one teacher. I’m very sorry now I didn’t go. My whole life might have turned out different. More about meeting Susanna Foster at this link. The interview above was quoted from this book, in which the complete transcript appears. Hi Sharon–I just finished reading your post on my mother’s passing, I do appreciate the kind words you offered. However I would like to help enlighten you with being better informed of the actual family dynamic thereof and what happened to my brother Philip. On that November evening in 1985 Philip lapsed into hepatic coma (liver failure) on my mother’s living room floor and died three days later in Van Nuys Hospital. He was deeply steeped in the disease of alcoholism…he was an ‘alcoholic’, a very very sick one. Our family was literally wracked- to- death by this and mental illness. As you know my poor mother had a very sick mother was also alcoholic AND mentally ill. Both of my mother’s sister were heavily afflicted by mental illness and alcoholism. The majority of their children are fated with this dilemma. My son is schizo-affective as well as alcoholic and my daughter is alcoholic. This is a family disease….and you’re right it is “truly a miracle” that I can even write this note to you.